After passing out a slew of offers over the weekend, the Buckeyes focused on Highland Park (Dallas, Texas) defensive end Prince Dorbah Wednesday evening. Dorbah is a 6-foot-4, 210-pound weak-side end that's ranked as a four-star prospect. He's considered Texas' 29th-best overall recruit in the class of 2020 and the 12th-best at his position. Nationally, he's ranked as the No. 264 prospect in the country. Currently, according to 247Sports, Dorbah has offers form eight schools including Alabama, Oklahoma and Texas. Three crystal ball predictions have been entered, all leaning towards the home-state Longhorns. For quite some time now, one of Ohio State's biggest targets in the class of 2019 has been Sacred Heart Griffin (Springfield, Ill.) offensive tackle Nick Broeker. Broeker, a 6-foot-6, 283-pound three-star prospect, is already committed to Ole Miss after he pledged to the Rebels on June 14. In the beginning of October, Broeker told Eleven Warriors, "I am committed to Ole Miss but I'm curious to see Ohio State. I haven't been to Ohio State for a visit but I've been in contact with them for a week. Mainly [offensive line] coach [Greg] Studrawa but coach [Urban] Meyer has messaged me a lot." Nothing has changed since that time but something could very soon ... and in a good way. Obviously, that's good news for the Buckeyes. If they were able to somehow flip Broeker's commitment, which was the case last week with Marcus Crowley, Broeker would join, currently, linemen Harry Miller, Doug Nester and Ryan Jacoby in the '19 Dynasty class. I'm sure Ohio State's coaching staff receives hundreds of highlight films per week. And while some may get glanced over and throw on top of a pile marked, "Nah, we're good," they've taken an interest in the one that 2020 in-state defensive lineman Tanner Cromer sent them. Cromer, unranked according to 247Sports, is listed at 6-foot-4, 225 pounds and doesn't yet have an offer. He does, however, have early interest from Ohio State, Clemson and Michigan State. Taver Johnson and Larry Johnson are currently on his trail for the Buckeyes. It's a safe bet that he'll continue to pop up on the radar during his senior year. The Reading Community (Cincinnati, Ohio) junior has been to Ohio Stadium and plans to make a return visit in the near future. So much has been said about the Buckeyes being able to keep in-state talent, well, in the state. Cromer could be one of those guys. THE IMPORTANCE OF WILSON AND JOHNSON JR.
You might be wondering why you're seeing a picture of Garrett Wilson at the top of today's Hurry Up, and you'd have good reason to wonder that since you haven't read his name yet. However, the reason is very simple: his, as well as Paris Johnson Jr.'s, importance on the recruiting trail has been second to none. Sure, Ohio State's coaching staff has worked extremely hard to bring in top-level talent within the program's next two recruiting classes. But Wilson and Johnson Jr.'s presence in those cycles have been extremely evident, more so than any other current Ohio State commit. Wilson has repeatedly said he reaches out to recruits around the nation, pleading Ohio State's case while Johnson has been at seemingly every home game, talking to prospects and helping them find their way around while having serious conversations about the future. You all already know this if you've even half been paying attention. But this past weekend was a huge three-day recruiting process. The Buckeyes gained two commits, from Jaxon-Smith Njigba and Marcus Crowley, and made their impression on scores of others. The quote of the weekend for me? 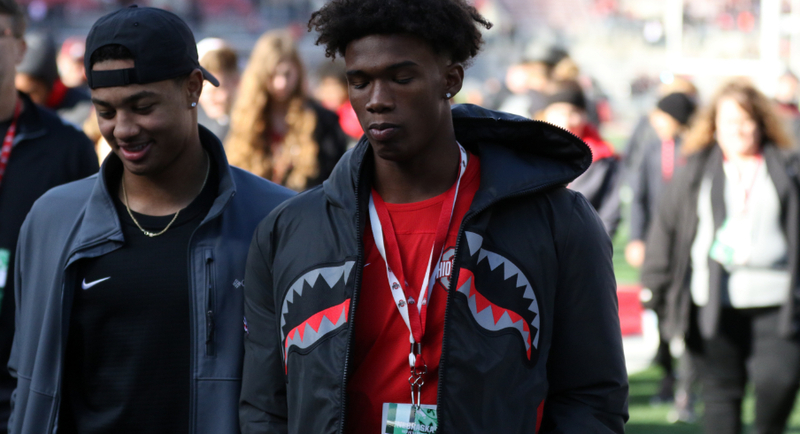 Smith-Njigba said it best after his commitment to Ohio State on Sunday evening: "Garrett [Wilson] played a big role in recruiting me, as well." Yeah, that sounds just about right and remember, Wilson and Johnson Jr. are talking to others.